It’s Time to Move…RENTING vs SELLING the Family Home? You are here:Newsletters > It’s Time to Move…RENTING vs SELLING the Family Home? When it’s time to move on, depending on the circumstances, there is a decision that needs to be made about your principal place of residence - the family home; and that is, should we sell it or rent it out? Below is a list of SIX considerations that may assist you make, what is a difficult, but important decision. Financial – this is usually the bottom line. You must weigh up the income returned versus costs associated with renting out your home and do the same exercise with the selling scenario. You need to ensure that you minimise any financial stress, by driving this decision with a strong focus on what is most financially advantageous. Emotional – one can never disregard the extent of the emotion that floats around selling a family home. This place is not just somewhere to live, it’s been your ‘home’; cherished memories have been created here over the time, and it can be hard to say goodbye, particularly if there may be a chance that you may possibly move back in the future. Future Capital Growth – whilst no-one has a crystal ball; it is fairly safe to say that your property will appreciate in value over time – particularly in the medium-longer term. 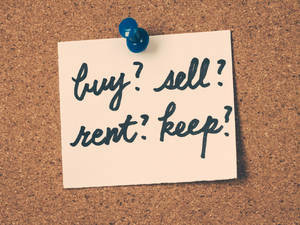 If you rent your property out, particularly for a substantial amount of time its price will increase. However, it’s worth considering the cost of the maintenance (even with the tax benefits), and the way the property will be cared for in your absence. If you rent it out, you may need to expend major capital on the property at a later date to prepare for market. Tax – there are taxation considerations to take into account when renting out your family home, so it is critical you seek independent financial and tax advice prior to making the decision. Issues surrounding depreciation, capital gains tax, and ownership structure will impact on the viability of this decision. Mortgage Health Check – this is also a time to have a look at your current mortgage product, if you are going to be using your family home as an investment property, it might be worth restructuring your loan. Whilst the financial considerations will most likely be, the key drivers of the decision, it is also important to acknowledge the emotional drivers, so that you make a decision that fits right intuitively, and you can move on, feeling comfortable with the outcome.